The "Baby It's Cold Outside" (The New Yorker) 1000 Piece puzzle depicts a winter scene unlike any other. 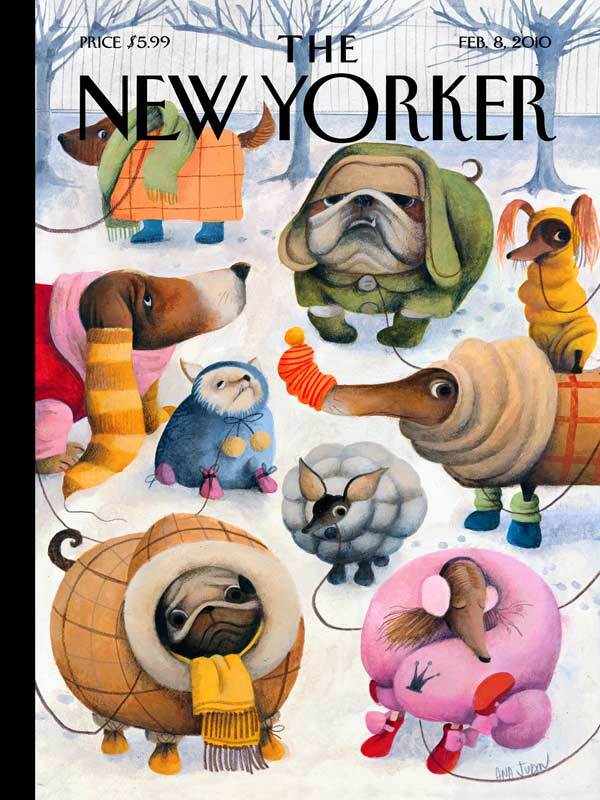 An array of dogs, which include a chihuahua, beagle, hound, pug, and others, brave the snowy weather in coats and scarves. Some of the dogs appear perfectly content in their sweaters, while others are utterly humiliated. It seems these dogs are attached to a leash, however, their owners are nowhere to be seen. This visual only adds to the idea that these dogs, who are dressed in people clothes, are wholly independent. It's a comical, witty, yet sophisticated scene that made the cover of The New Yorker on February 8, 2010. This jigsaw puzzle, through the perspective of a waggish group of dogs, will forever be a token of the whimsical winter spirit . Very much enjoying working on this puzzle. Fast shipping and better prices than Amazon. Amazing selection & super fast shipping! Such a fun 1,000 piece puzzle. These ARE challenging but fun pictures. This was a perfect puzzle to do for the last piece of winter. Loved the picture. Adorable puzzle, fun and quick! I am a pretty avid puzzler but this was my first one from the NY Puzzle co. There were quite a few pieces ( maybe 75-100) that were still joined (hadn't been completely cut apart) which was annoying because I had to separate all of them before beginning the puzzle. I don't know if this was an isolated incident or common with this company. Aside from that I enjoyed it very much. For that reason I cannot give it 5 stars. Adorable puzzle! Pieces are sturdy and easy to handle. This puzzle was very challenging. It's so cute and so much fun to solve. I'm always wanting more more more New Yorker covers. They are fabulous. This puzzle is of the highest quality! The finished product was beautiful. The price was extremely reasonable considering the quality! !